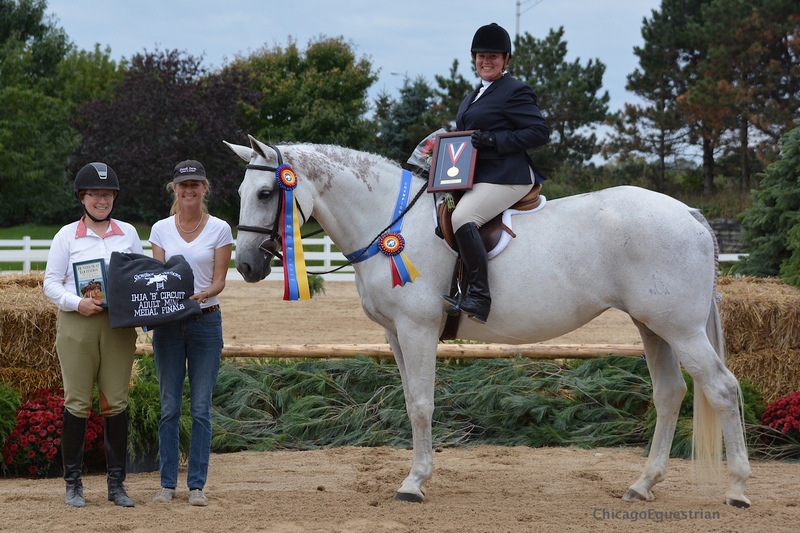 Roscoe, IL – September 27, 2015 – Riders celebrated the end of the 2015 show season as Showplace Productions hosted the IHJA B Finals, which included the circuit medal finals competition and the final Chicago Equestrian Hunter Derby. 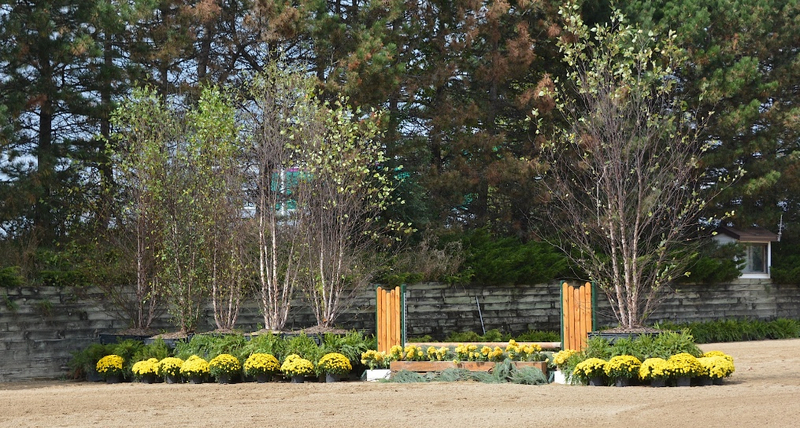 In typical Showplace style, manager Patrick Boyle had a beautiful course with mums in bloom and trees carefully placed around the Ledges Sporting Horses grand prix ring, making it look like a national championship track. Spectators enjoyed VIP treatment on the deck, with an amazing brunch sponsored by Devoucoux and giveaways from Chicago Equestrian, as they cheered on the finalists. Proving once again that Boyle goes all out for all levels of competition, Star Creek Video provided a live broadcast that could be seen at starcreeklive.com, with medal commentary by Diane Carney, a USEF R HU/EQ/JP judge. Boyle had the IHJA A Finals earlier this month live streamed with Carney’s commentary and was also the first manager to have a USHJA National Championship broadcast when he held the USHJA Children’s Adult North Region Championships this year from Ledges Sporting Horses as well. All events can be seen on demand at www.starcreekvideo.com. 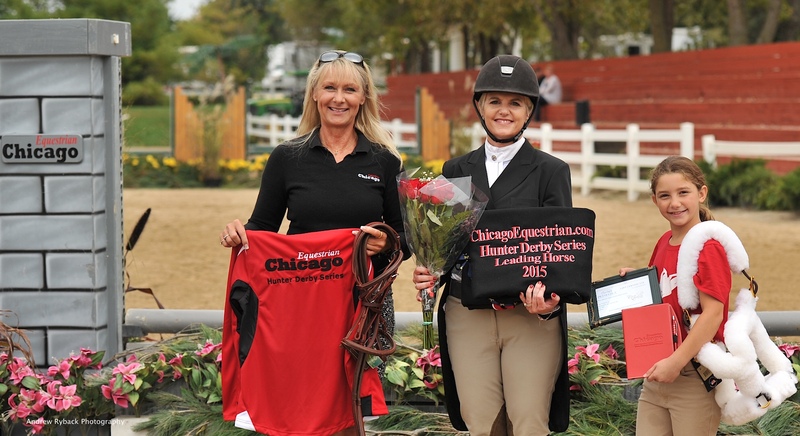 The day began with 55 riders taking a swing at the ChicagoEquestrian.com Hunter Derby. The series offered 11 derbies throughout the season with fence heights at 2’, 2’6” and 3’. 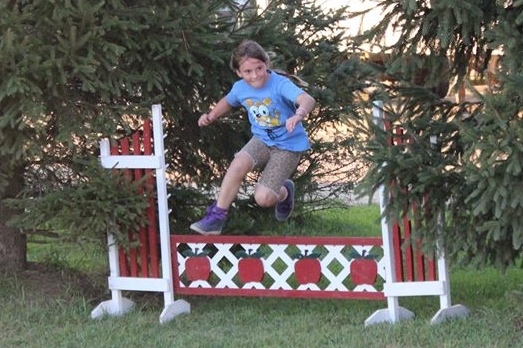 The derby series gives riders an opportunity to try a derby at the appropriate fence height for their ability and aides in giving them skills needed to improve their riding. The top 12 horse and rider combinations returned for the handy round with Mara Winston Grigg and her mount, Ocala, in the lead with an 89 and Juliana Gullo with A Certain Charm, in second with an 86. During the handy round riders had to demonstrate a trot jump and a hand gallop over the shortened course to impress judges for their second round score. It was trainer Mara Kranz and Perfecta Farm’s Pouwer who topped the leader board with a second round score of 87 added to her 84 for a 171 for the win. Abigail Jackman and Can’t Beat the Feeling moved up the rankings with her handy round score of 88 added to her 81 for a 169 to take second. Kranz rode several horses owned by Perfecta Farm and Kim Gardiner throughout the series to earn her leading rider points. Pouwer, is a horse they’ve had for about two years and Kranz added, he’s a blast to ride. The awards were plentiful as usual at a Showplace event, with the top 10 derby riders receiving gift bags with hats, t-shirts and other sponsor giveaways. The winner received a cooler and a SmartPak bridle and second place received a Walsh grooming halter. 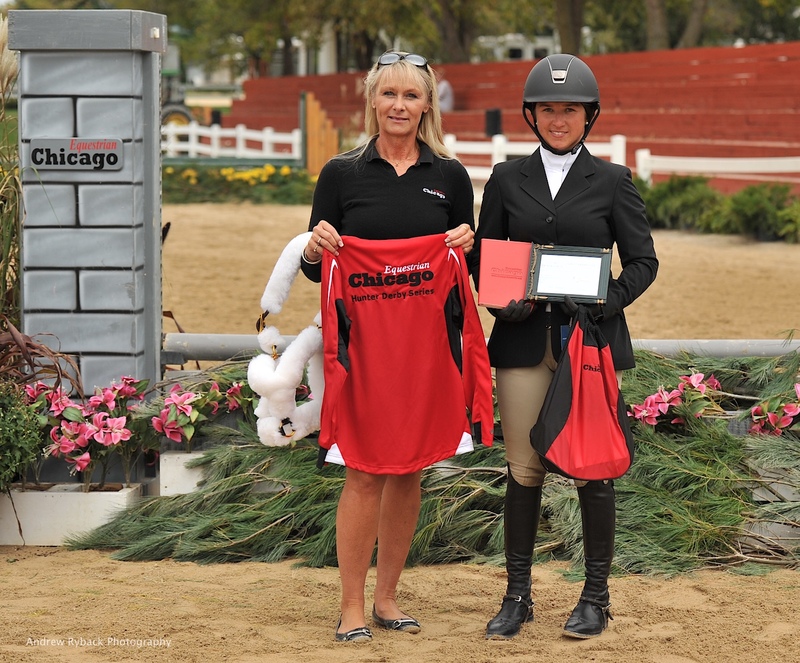 The ChicagoEquestrian.com Derby Series gave awards for the Leading Horse in the series and Leading Junior, Professional and Adult riders who accumulated points throughout the season. 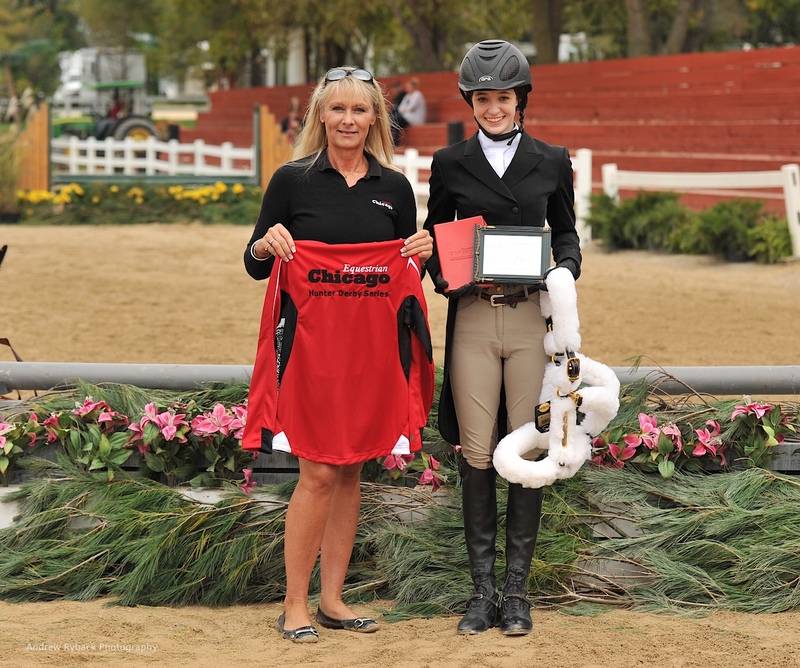 Riders received a Walsh shipping halter, a Chicago Equestrian jacket donated by G4 Marketing and a $200 gift certificate from Devoucoux. The leading horse received a cooler donated by Ann Hubbards Tack Shop and a bridle donated by Devoucoux. True North and Kogen have had a great year, winning their first derby back in June at Showplace Spring Spectacular and then winning the 2’6” Annali-Brookwood Farm Derby in July. Kogen trains with Scott and Josie Gentry at HBG Equine in Bristol, WI, and looks forward to riding in more derbies. Abigail Jackman moved up the rankings with Can’t Beat the Feeling to clinch the Leading Junior Rider on a Horse in the Series. Her second place finish earned her double points to take the top spot in the standings. 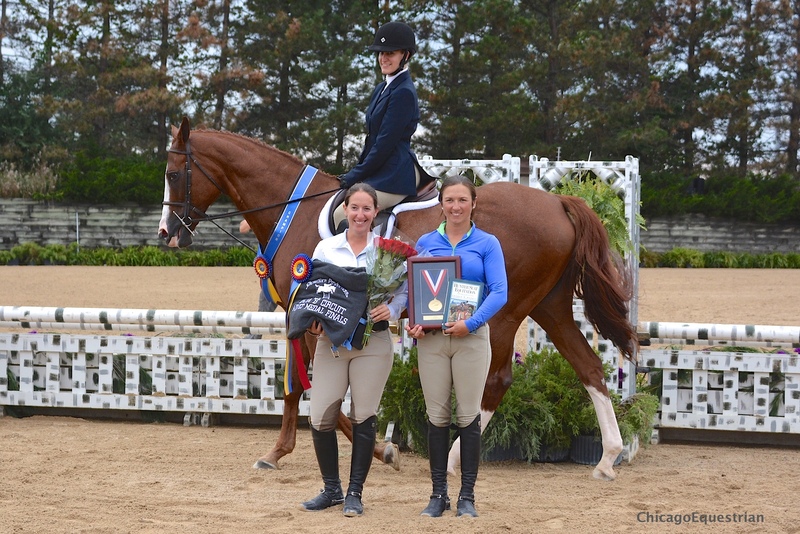 Abigail Jackman won the Leading Junior Rider on a Horse Award for the Chicago Equestrian Derby Series.Photo Andrew Ryback. With her win in the derby, Mara Kranz took over the lead for Leading Professional Rider in the series. The day continued with the IHJA B Medal Finals. Limit Medal riders had their turn in the grand prix ring, which is a special treat for most of these riders that never get a chance to ride in the big ring. 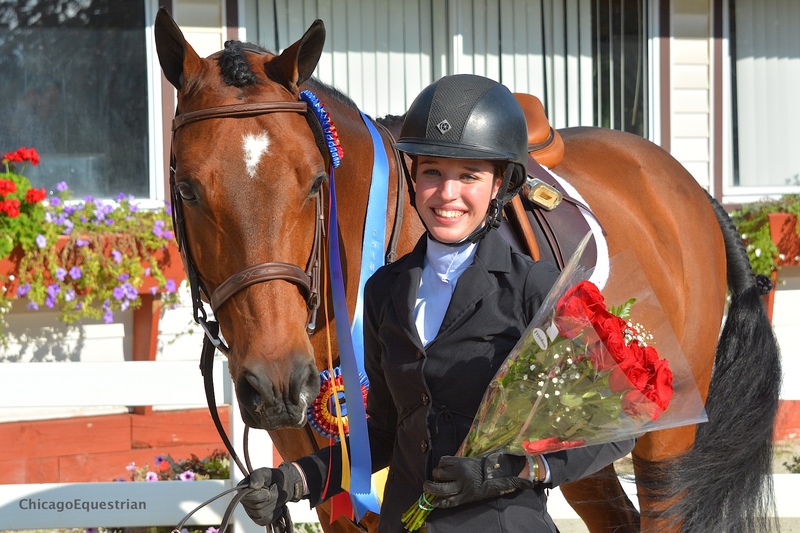 Perfecta Farm rider Juliana Gullo and A Certain Charm took the top billing in the largest medal class of the day. Gullo had a first round score of 85 and was able to perform the additional testing asked of the judges to earn her the blue ribbon. 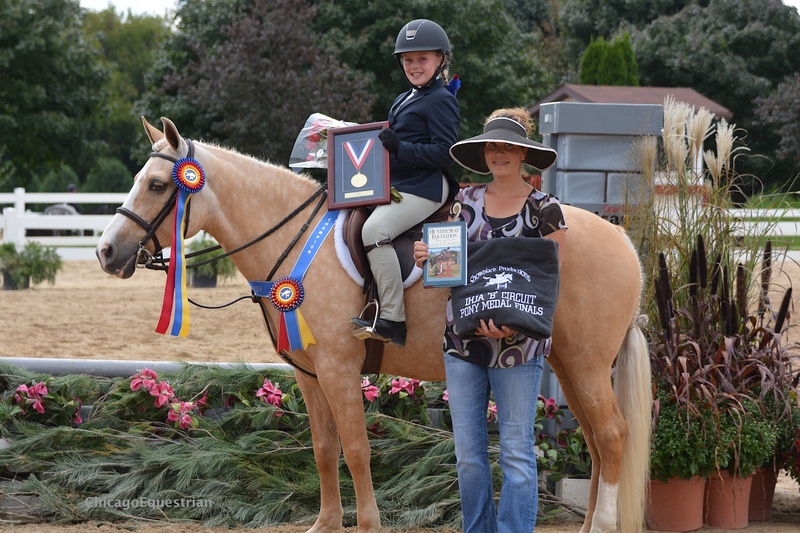 Each rider received a beautiful framed gold medal, roses, a cooler and an additional gift of the Hunter Seat Equitation book by George H. Morris, donated by the George H. Morris November Clinic at Annali-Brookwood Farm. 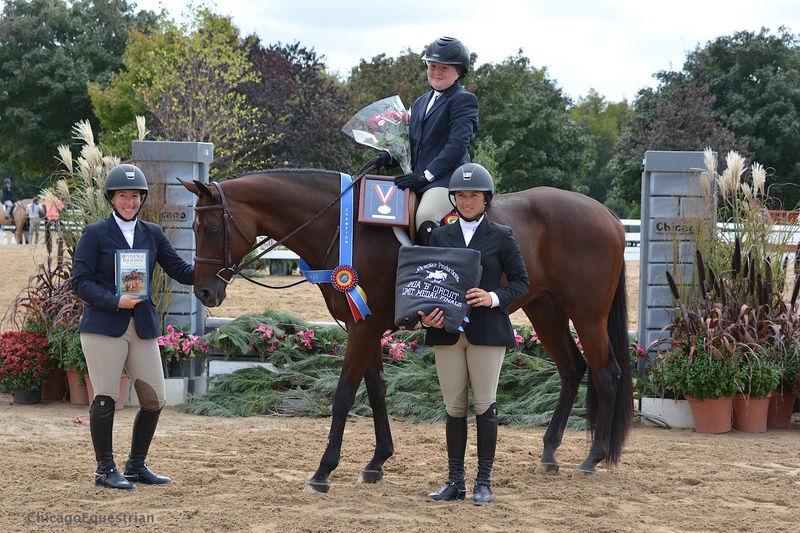 Kendall George and Good as Gold earned the top prize in the Pony Medal. It was a bittersweet day for George, who rides with Sirena Liggett at Platinum Farm. George got a new pony so this was her last ride on Good as Gold as she accepted the award with emotion and took one last victory gallop on the pony she had great success with the past several years. George won the Leading Junior Rider on a Pony Award for the Derby Series earlier in the day, making her last day with her much loved partner, just perfect. “It was amazing to win. This pony is so perfect and I’m so blessed to have her,” said George as tears welled up in her eyes. Abigail Jackman won the Children's Mini Medal Final. Photo Chicago Equestrian. 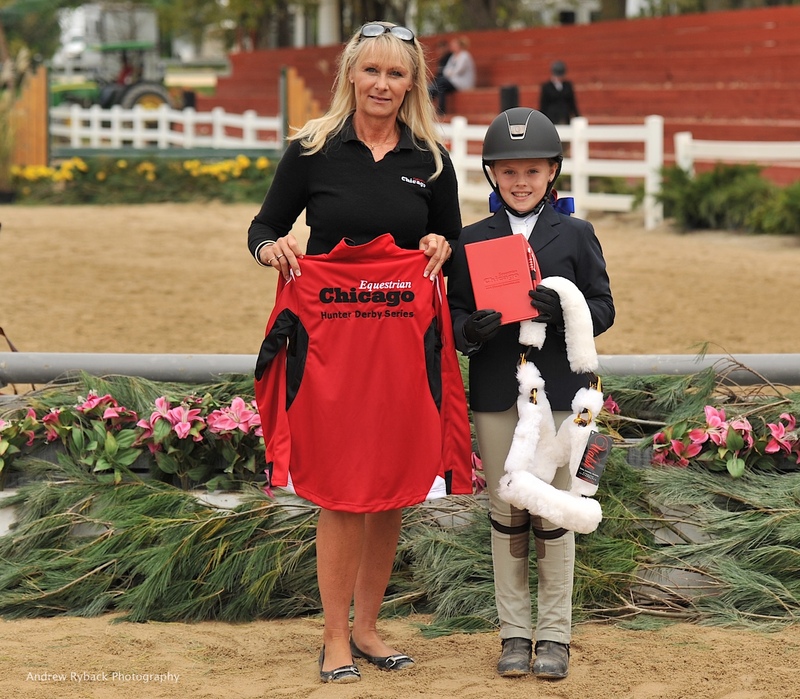 The juniors were on fire as the Leading Junior Rider on a Horse in the Chicago Equestrian Derby Series also won the Children’s Mini Medal. Abigail Jackman moved up in the testing phase for the win with her horse Can’t Beat the Feeling. Jackman rides with trainer Erin Hirsch. Kelly Carson won the Adult Mini Medal Final. Photo Chicago Equestrian. 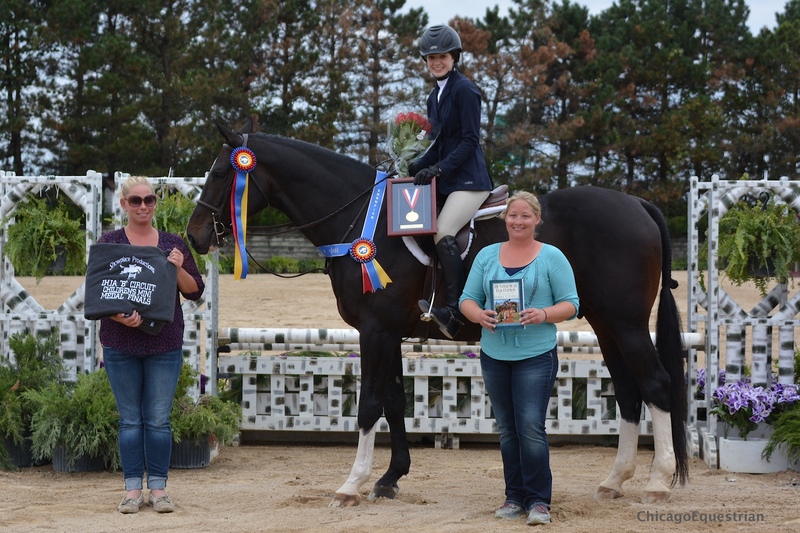 The winner in the Adult Mini Medal was Kelly Carson on Cindy McElligott’s Platinum Future. Carson rides with Heide Cascairo at Tievoli Farm and was grateful for the chance to ride the big grey, who helped her earn an 85 in the first round. Andrea Pileggi won the Adult Medal Final. Photo Chicago Equestrian. The judges, Jeff Wirthman and Richard Wilkenson, kept putting the riders through their paces and the awards kept coming, with the final two medal classes of the day getting their chance in the ring. 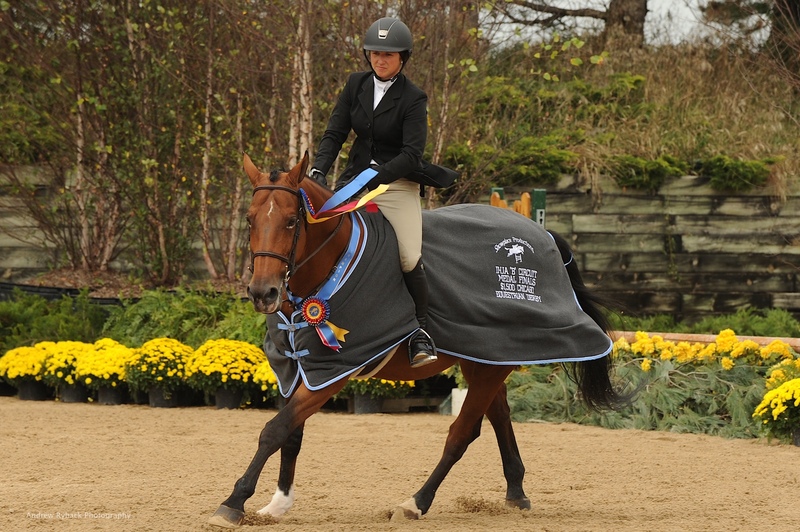 Winning the Adult Medal was Perfecta Farm rider Andrea Pileggi, of Schaumburg, IL, riding Perfecta Farm’s Lumiere. This was Pileggi’s first finals so she was surprised when her number was called as the winner. Anna Prah won the Junior Medal Final. Photo Chicago Equestrian. Anna Prah, 15, was the best of the pack in the Junior Medal, riding a borrowed horse from Jeannine Lamb Hugi. Trained by her mother, Diane McClure of Gateway Farm, Prah rode Ted E Bear to the win after moving up in the work off. Prah is a sophomore at Taft High School in Norwood Park and rides about five times a week. She is looking forward to next show season and possibly getting a new horse to work with. Riders celebrated the close of the season with an Exhibitor’s party Saturday night and a horseless horse show for some extra fun. Showplace Productions is known for their top of the line shows with experienced management and office staff, great courses and jumps, top judges, beautiful awards and over the top hospitality. Their innovative approach allows them to offer specialty events and classes such as the Showplace Equitation Classic, free entries for young jumpers, Calcutta’s for fundraising and clinics and educational opportunities as well as live streaming of their events. 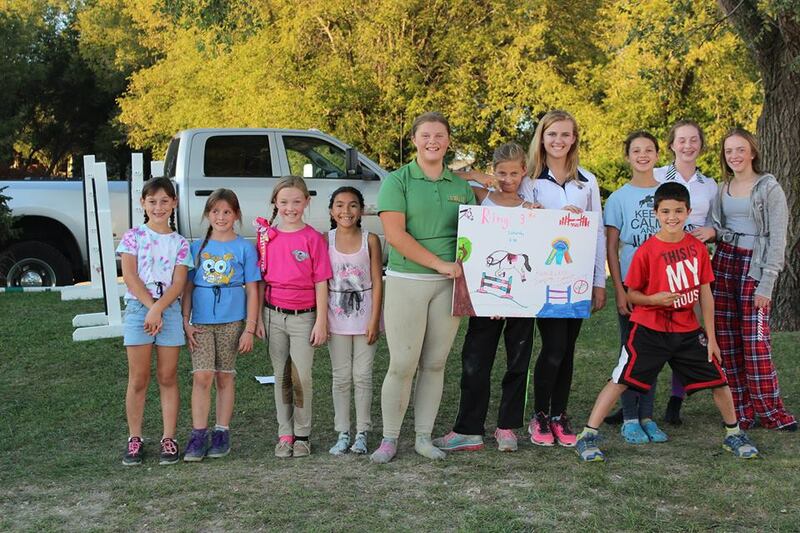 Kids enjoyed the horseless horse show. 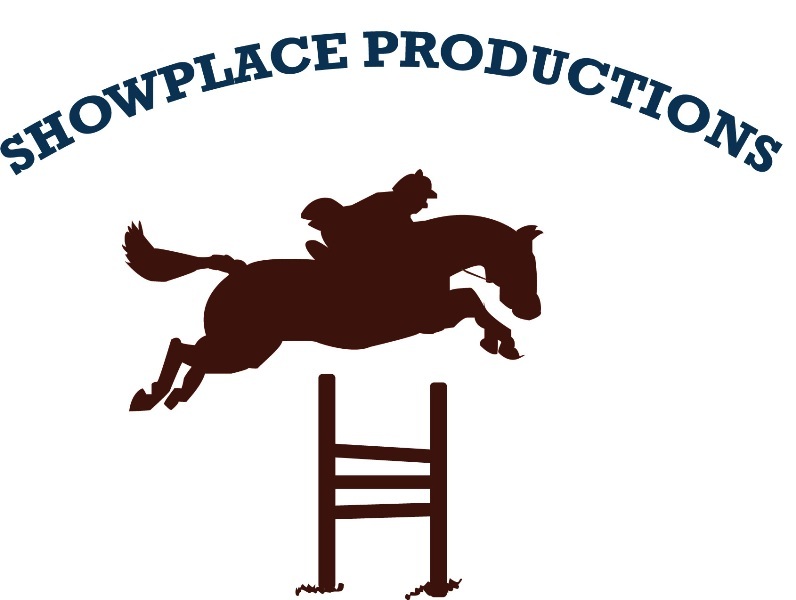 Showplace Productions moves on to the Minnesota Fall Harvest Horse Show, October 6-11th and then to the IHJA Banquet, November 21st, where Boyle and his staff organize a multitude of awards for both the A and B circuits and all the divisions for the season. In usual Showplace Productions’ style, the banquet is an evening of amazing prizes, a video production by Star Creek Video, dinner, dancing and celebration. A schedule of the Showplace 2016 Winter Circuit Shows will be available soon, please visit their website at www.showplaceproductions.com. To contact Patrick Boyle to host your event, email him at showsno1@aol.com.